As a young girl growing up in Sarasota, Fla., Christina Warren dreamed of being a college athlete. Initially, Warren viewed tennis as her route to the next level, winning multiple USTA (United State Tennis Association) titles in youth competition. But after suffering a back injury as a 15-year-old, Warren switched to rowing, joining the Sarasota Crew club program. Helping the Sarasota Crew varsity 8 to regional crowns and a seventh place finish at the USRowing youth nationals, Warren realized her dream of competing at the next level, committing to Princeton University and joining its women’s lightweight rowing program. Over the next four years, Warren enjoyed a superb career as a college athlete, rowing for the varsity 8 all four seasons, serving as a two-time team captain, and helping the Princeton top boat take third at the IRA (Intercollegiate Rowing Association) national championship earlier this month, the first medal for the boat at the IRA since 2011. Warren and fellow co-captain Juliette Hackett were named to the 2017 Collegiate Rowing Coaches Association All-America team. Upon joining the Princeton program, Warren made an immediate impact. “I was on the faster end for lightweight rowers,” said Warren, noting that she and Hackett were both in the top boat from the beginning. In reflecting on her Princeton career, Warren acknowledges it was an uneven progression with plenty of ups and downs. “Some of it was really, really fun and some of it was really trying,” said Warren. Coming into her senior year, Warren quickly got the sense that it was going to be a fun season. “Our first row in the varsity 8 in the fall in the lineup felt 10 times better than our IRAs training lineup from the year before,” said Warren. Being a two-time captain gave Warren the chance to hone her leadership skills. “Juliette and I are best friends; we work together really well,” noted Warren. The Tigers started the season well by taking third in the Knecht Cup, a race that draws the top women’s lightweight crews in the nation. 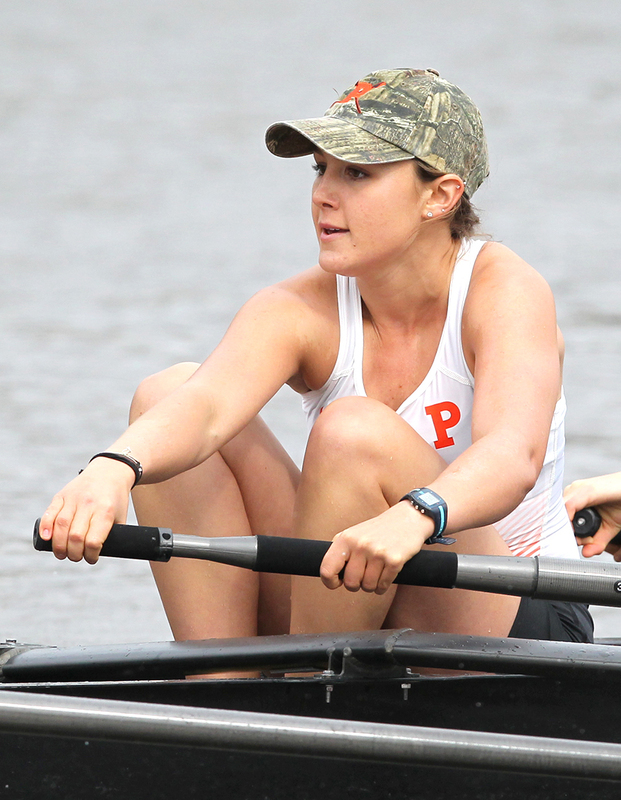 In mid-May, Princeton placed third at the Eastern Sprints, finishing about 0.1 of a second behind second-place Wisconsin. The photo finish at Sprints gave Princeton extra motivation as it trained for the IRA national championship regatta. Over that three-week period, the Tigers got the most of their practices as they primed for the competition which was held on Lake Natoma in Sacramento, Calif. from June 2-4. “We worked really hard, we got a ton of miles in and a ton of really good pieces and training,” said Warren. Princeton showed its speed at the IRA regatta, producing its finest performance of the spring in the grand final. The Tigers took third in a time of 6:32.890 over the 2,000-meter course with Stanford posting a winning time of 6:25.396 and Boston University taking second in 6:30.608. Nemesis Wisconsin came in fourth in 6:36.444. “In order for us to get a medal we had to have a blazing start and not let off the gas at all,” said Warren, reflecting on the medal-winning effort. For Warren, giving her best on the water is a lesson that will serve her well as she enters the real world. “Our coach said you have taught us, the seniors especially, that it is so important to never give up,” said Warren, who will be starting work this summer for a marketing software company in New York City.